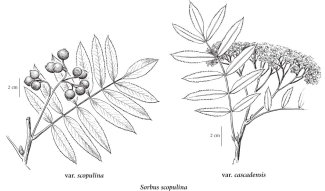 Medium to tall shrub, 1-5 m tall; stems several, erect to spreading, freely branched, reddish-brown to yellowish; winter buds and young growth sticky, somewhat white- or grey-hairy. Alternate, deciduous, pinnately compound; leaflets (7) 9 to 13, oblong-lanceolate to narrowly elliptic, 2-8 cm long, usually short-tapering to a sharp-pointed tip, smooth, finely saw-toothed almost to the base. Inflorescence a flat-topped to somewhat rounded, branched cluster of numerous (70 to 200 or more) small flowers, the branches more or less white-hairy; corollas white to cream, the petals 5, oval, 4-6 mm long; calyces white-hairy, 5-lobed, the lobes triangular; ovaries inferior; stamens 15-20. Berry-like pomes (like miniature apples), nearly globe-shaped, 7-10 mm long, orange to scarlet, not glaucous, 2- to 5-chambered; seeds 1 or 2 per chamber. 1. Leaflets rarely more than 11; stipules persistent until after blooming; plants from W slope of Cascade Mountains..................... var. cascadensis (G.N Jones) C.L. Hitchc. Mesic to moist glades, streambanks, forest edges and open forests in the montane and subalpine zones; frequent throughout BC, except rare W of Coast-Cascade Mountains; N to AK, E to AB and S to ND, WY, NM and N CA. 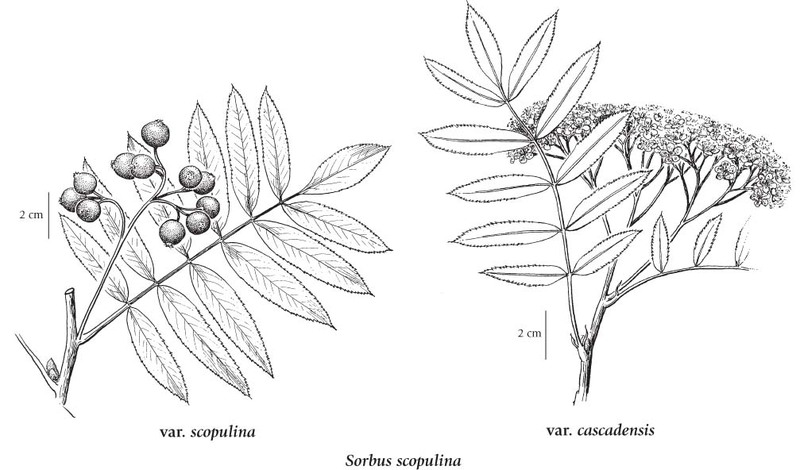 A shade-tolerant/intolerant to very shade-intolerant, montane to subalpine, Western North American deciduous shrub distributed in the Cordilleran region, marginally in the Pacific and Central regions. Occurs in continental boreal and wet cool temperate climates on moderately dry to fresh, nitrogen-medium soils; its occurrence increases with increasing continentality. Common but scattered in open-canopy, coniferous forests on water­shedding sites; persists in clearings. Characteristic of Mor humus forms.